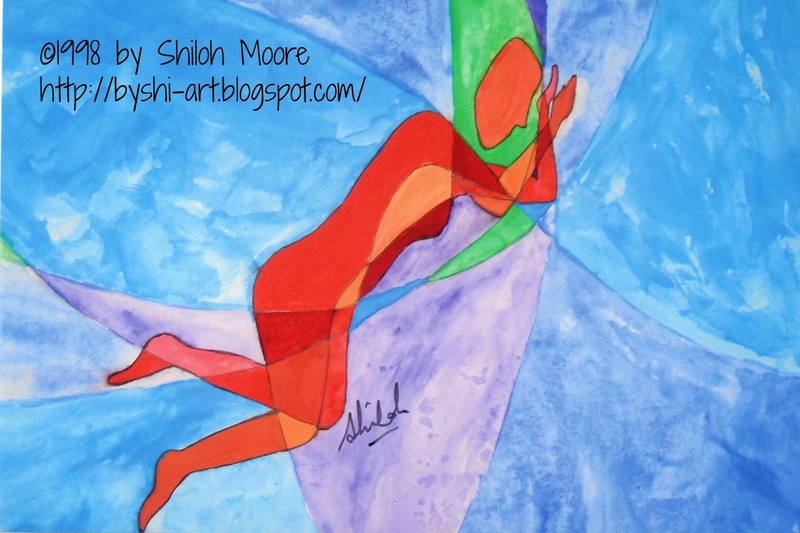 ‘Resting Peace’ © 1998 by Shiloh Moore Watercolour on A3 paper. I painted ‘Resting Peace’ 15 years ago when I was 18 and dependent on a wheelchair to leave the house, recovering from a full year totally bedridden barely able to talk or eat or sit up. My mother bathed and fed me during this time and even this was a mammoth effort for me. The blues and purples in the outside of the picture represent the ease of the world, the beauty outside of my body. The reds of my body represent pain and discomfort, blood stagnant and aching all over. This was my rest. I would try to tune out the pain in my body and see if I could notice and take on the outside stimulus of the gentle blues. Mostly I was overwhelmed with the pain. Now, 15 years later and still experiencing extreme pain constantly, I realise it’s not my body that confines me and causes me grief. My poor little body is so weakend by this powerful illness and yet it still keeps going, keeps fighting, keeps me alive to experience the love, small joys and simple pleasures of this wonderful world. It allows me to experience existence. My body is not a cage trapping me in torture, it is an amazingly strong and resilient beautiful marvel coping with a massive load while still helping me experience this life, which beyond the illness is precious. My body’s a fighter, powerful and valuable. Oh little body how I love you.